Do your joints ache and feel stiff every morning? Is it getting harder to bend over to pick up items on the floor or to tie your shoes up? Did you know that nearly 27 million Americans suffer from the same problem? Many Asian cultures developed sophisticated health exercises which were designed to maintain and restore flexibility. In China alone, one recent survey recorded over 40,000 Chi Kung different schools, an ancient health discipline. The author spent over 30 years exploring Chinese and Japanese martial arts and healing systems. How to increase flexibility is a short set of exercises that condenses the best joint exercises into 3 simple sets that can be practised in as little as 10 minutes. These exercises combine complementary approaches such as Tai Chi and Chi Kung. They also focus on spiralling joints and strengthening tendons rather than the approach used by Yoga which tends to just stretch the joints and muscles. However, regular practice will start to minimise or fix joint stiffness. These are also designed to gently improve your flexibility. These are suitable for most people regardless of their age or stature. And it’s perfect for anyone who’s not capable of vigorous exercise but still wants a big boost in their mobility. No Human Pretzel Yoga exercises here. Loosen your hips and back. It gently opens up the discs in your lower back. Massages your kidneys which according to Chinese medicine are the key to living longer. Strengthen and loosen each of the major joints in your body even if you have limited mobility to start with. Strengthen your tendons, the real key to long term joint health. The ancient Chinese knew this, but Western exercise systems seem to ignore them….. 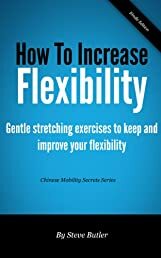 The exercises in "How to increase flexibility" take just a few minutes to do. You can do it in the comfort of your own home, or even outside. It doesn’t need any equipment or much space. They have been tested with hundreds of students in the UK.